Using olive oil and lemon juice to help with gallstones is often referred to as a gallbladder cleanse or gallbladder flush. Mayo Clinic notes that gallbladder cleanses consist of taking olive oil, fruit juice, and sometimes herbs for two days or longer to help stimulate the gallbladder, break up gallstones, and release the stones in your stool. Drink four ounces of olive oil or coconut oil. Drink four ounces of lemon juice. Lay down on your right side for 60 minutes. Dr. David Williams recommends doing a seven-day gallbladder flush that includes lemon and olive oil, although he includes a few other steps in the process, as well. Drink as much apple cider or apple juice as you can in addition to regular meals from Monday through noon on Saturday. Take three disodium phosphate capsules with one cup of water three hours after lunch, and again five hours after lunch. Have grapefruit, other citrus fruits, grapefruit juice, or other citrus juices for dinner Saturday. Right before bed, drink 1/2 cup of warm olive oil combined with 1/2 cup of lemon juice. Go to bed and lie on your right side for the first 30 minutes. The next morning, take three disodium phosphate capsules with one cup of water (one hour before breakfast) to complete the flush. According to a 2009 review published in Alternative Medicine Review, some people say gallstone flushes have worked for them. But while there are anecdotal reports of gallbladder flushes breaking up and passing stones, research doesn't back up these claims, according to Mayo Clinic. One 2014 study in the World Journal of Gastroenterology found that gallstone flush methods were frequently used in misleading YouTube videos, and that one patient who drank lemon juice and olive oil excreted lumps in stool that resembled gallstones. However, analysis showed they were not. Mayo Clinic confirms that gallbladder cleanses can produce lumps made of oil and juice in stool that resemble gallstones. Olive oil is heart-healthy. It could reduce your risk for heart disease when used in your diet in place of saturated fat, and lemon juice is an excellent source of vitamin C. The 2009 review in Alternative Medicine Review suggests unsaturated fat (found in olive oil and other plant-based oils) and vitamin C are two nutrients that may help prevent gallstones. However, drinking 1/2 cup of olive oil adds almost 1,000 calories to your meal plan, which isn't good when you're trying to maintain a healthy weight. Likewise, drinking olive oil doesn't taste very good. Furthermore, ingesting large amounts of lemon juice can cause tooth erosion, according to one 2015 study. Drinking olive oil and lemon juice often comes with side effects. Ingesting large doses of olive oil has a laxative effect, which can cause diarrhea. 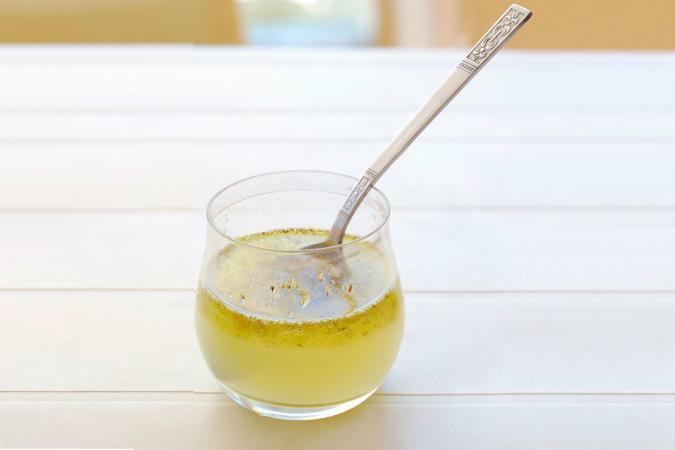 Dr. David Williams reports that you may feel nauseated, discomfort in your gallbladder, or experience changes in stool after drinking olive oil and lemon juice. Mayo Clinic says in addition to nausea and diarrhea, other side effects of gallbladder flushes include lumps in stool, vomiting, and abdominal pain. If you suffer from gallstones, talk with your doctor about which treatment options are right for you. Not all gallstones are problematic or require treatment. However, if gallstones cause blockages and you experience pain lasting longer than a few hours, nausea, vomiting, chills, fever, light-colored stool, yellow eyes or skin (jaundice), or tea-colored urine, seek medical attention right away, suggests the National Institute of Diabetes and Digestive and Kidney Diseases (NIDDK). Medical treatment options used to treat gallbladder attacks include gallbladder removal surgery, shock wave lithotripsy (shock waves that crush gallstones), and medications containing bile acids that dissolve gallstones. However, the NIDDK says non-surgical treatment options typically last about five years, and gallstones often return after that period. If your doctor gives you the okay, trying a gallbladder flush with olive oil and lemon juice likely won't harm you although it may taste gross and can cause unpleasant side effects. However, using this home remedy to treat gallstones isn't backed by research, and while you may pass small lumps in your stool after a flush, the lumps likely aren't gallstones. Whatever you decide, always keep your doctor informed.